A spring tradition at Cedar Crest! 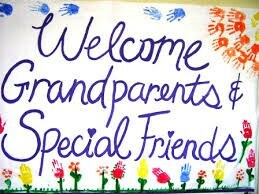 Grandparents and Special Friends share our love of learning and art on Friday, May 3, 2:00 p.m.
Grandparents & Special Friends Day begins at 2:00 p.m. in the gymnasium. Refreshments are served in the gym after the student presentation. This year’s theme is Who's Who. Grandparents are welcome to enjoy refreshments, tour the Arts Festival in the gym, and visit the Scholastic Book Fair in the library. Come share our creativity in the Cedar Crest Gymnasium.